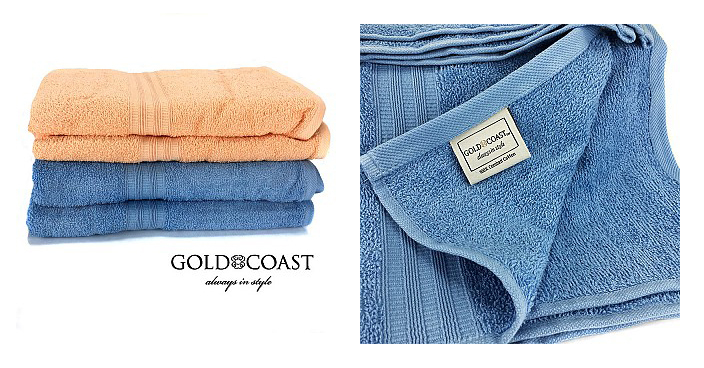 Luxurious Gold Coast 100% Combed Cotton Towels Just $2.99! Down From $12! You are here: Home / Great Deals / Luxurious Gold Coast 100% Combed Cotton Towels Just $2.99! Down From $12! 13 Deals has these Luxurious Gold Coast 100% Combed Cotton Towels for just $2.99 (Reg. $12)! Please keep in mind that shipping is not FREE! Wrap yourself in the greatest comfort after a shower or bath in a luxurious 100% combed cotton bath towel by Gold Coast Linens. Made in India from 100% combed cotton these soft towels are meant to dry you quickly and efficiently and be ready to do it all over again the next day. No more damp towels that take days to dry out. Indulge yourself in this towel’s generous proportions measuring 26 x 52 inches. Comes in a Coral or Blue color and is machine washable.